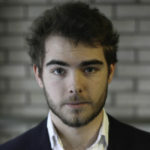 Scottish baritone Arthur Bruce is a graduate of the Royal Northern College of Music, English National Opera’s ‘Opera Works’ programme and Scottish Opera’s Connect ensemble. Arthur returned to Scotland last year to begin postgraduate studies at the Royal Conservatoire of Scotland’s Alexander Gibson Opera School. Arthur’s continued studies are generously supported by Help Musicians UK and the Daniel Derby Wood Fund. Operatic engagements include Chorus for Scottish Opera and for Opera Holland Park, Papageno (Die Zauberflöte) for Berlin Opera Academy, Pierre Lafitte in the European première of Amy Beach’s opera Cabildo, Zurga (Les Pêcheurs de Perles) for Edinburgh Grand Opera, Guglielmo (Così fan Tutte) at Bedford Park Festival in London and at Chez Cartier in France, Wolfram (Tannhäuser) with Edinburgh Players Opera Group, Harlekin (Ariadne auf Naxos) for Alexander Gibson Opera School Scenes, Henry Davis (Street Scene) for the Royal Conservatoire of Scotland Opera School, Sam (Trouble in Tahiti) with Royal Northern College of Music Chamber Opera, Prince Yamadori (Madama Butterfly) at Bowdon Festival Opera and Bobinet (La Vie Parisienne) with Ferrier Operatic Society. Upcoming engagements include Cappadocier, Zweiter Soldat and Fünfter Jude in Salome for Edinburgh Players Opera Group. This is Arthur’s debut performance with Saffron Opera Group.